Origin and Habitat: Rebutia kariusiana is a cultivated form presumably endemic to Northern Argentina, in the province of Salta, near the areal of Rebutia violaciflora a Rebutia beryllioide. 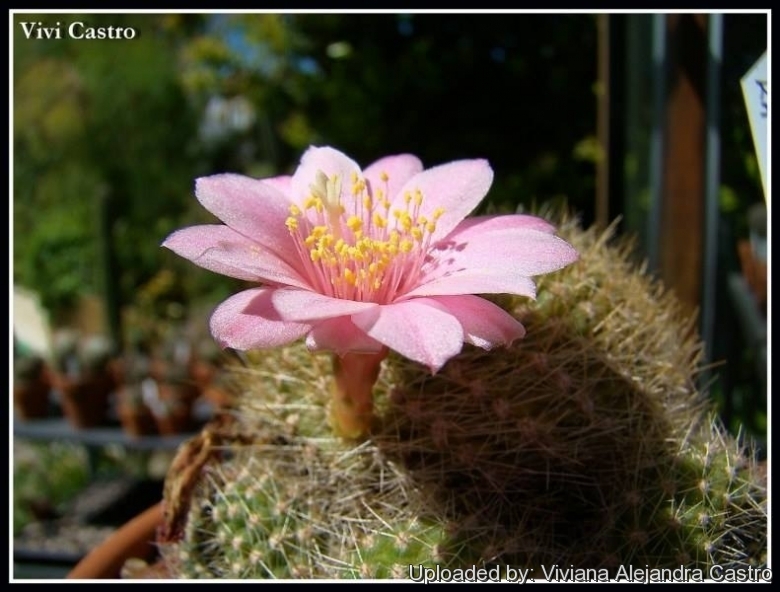 According to other information, the first original Rebutia kariusiana was found in a batch of Rebutia marsoneri and should come from an area in the province of Jujuy. 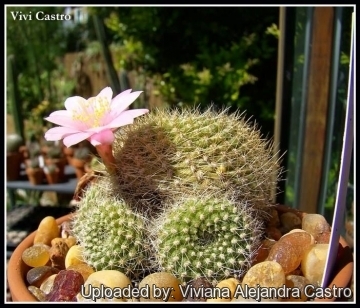 Description: Rebutia minuscula f. kariusiana|SN|15499]] (Rebutia kariusiana) is one of the many forms of the extremely variable Rebutia minuscula, and shows transitional characters between Rebutia minuscula subs. violaciflora|SN|15442]] and Rebutia wessneriana subs. beryllioides. It has pink-violet flowers and plants in cultivation shows minimal variability. The hue of the flowers is very uniform and characteristic. Slight differences in colour shade are probably just the result of differences in culture or age of the plants. R. kariusiana grows and blooms well and its uniformity is probably due to controlled pollination. It has comparatively larger stems than other “minuscula” and tends to stay solitary or produce few shoots only with age. It is autosterile (needs cross-pollination). Stems: Flattened globose to globose, apex depressed and spiny, bright green, bout 50 mm in diameter. Ribs: 16-21 with low, vertical or spiralled with distinct tubercles. Radial spines: About 8 to 10, fine 3-6 mm long, white to light brown, at first lighter. Central spines: 3 to 4, up to 6 mm long, dark brown, darker at base. Flowers: Slender funnel-form, 45 mm long, 40 mm wide, both inside and outside pale pink to bright violet pink . Self fertile. Buds pointed, light green. Flowers grow in profusion from the older areoles on the bottom half of the stem, often at the stem bases. Pericarpell, pale to olive green almost spherical, pale red, naked, covered with several darker red scales. Floral tube funnel-form, about 12 mm long, with pale green scales without hair bristles, which gradually change in the outer tepals. Outer perianth segments (tepals) acute-lanceolate, with a marked brownish mid strip on the outside. Inner perianth segment slightly wider, usually bright pink. Filaments yellow, anthers yellowish. Style free to base, pink, stigma with 4-5 white lobes only slightly protruding the anthers. Fruits: Globose, yellow-green, to 6 mm in diameter, drying and cracking irregularly. Seeds: Oblong, glossy black about 1 mm long and 0,7 mm wide, hilum basal, somewhat oblique, white. Remarks: Rebutia minuscula is quite variable. The differences concern the spination and flowers colour, however the size and number of spines is greatly influenced by the conditions of culture, at lower light levels the spines are less numerous, delicate and white, while with strong solar radiation the spines are stronger with a yellowish tint. In some cases differences are referable to separate population, but often occurred over a long period of cultivation due to autogamy. Many such variants have been described as species in the past. Cultivation and Propagation: Rebutia kariusiana (Rebutia minuscula f. kariusiana|SN|15499]]) comes from mountainous areas, so like bright light, and cool and dry conditions in the winter. The whole Rebutia minuscula complex has delightful flowers and the plants remain compact, and clumps can easily be managed by division. It is easy to cultivate and recommended for beginners.